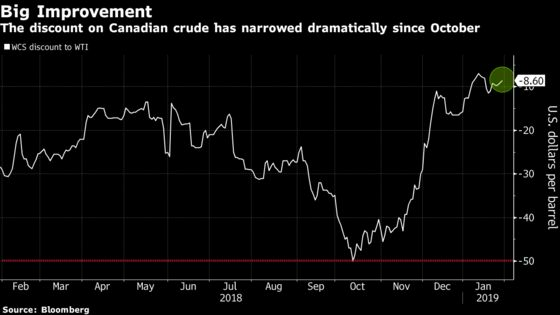 (Bloomberg) -- Alberta is easing mandatory oil curtailments after prices for heavy crude from the Canadian province surged while producers were getting exasperated. The new target for output next month will be 3.63 million barrels a day, up from 3.56 million in January, the provincial government said in a statement Wednesday. Inventories have dropped by 5 million barrels, reducing a glut that depressed prices. The discount on heavy Canadian crude to the U.S. benchmark widened after the announcement to $9.50 a barrel from $8.60 earlier, according to traders.